LEAP Australia would like to congratulate the team from Monash University for winning the 2013 Australian Formula SAE Competition. As proud supporters of the Formula SAE Competition, LEAP Australia works closely with many university FSAE teams across Australia and New Zealand, offering assistance through training and mentoring of student team-members who are applying CAE techniques to maximize the performance of their car designs. 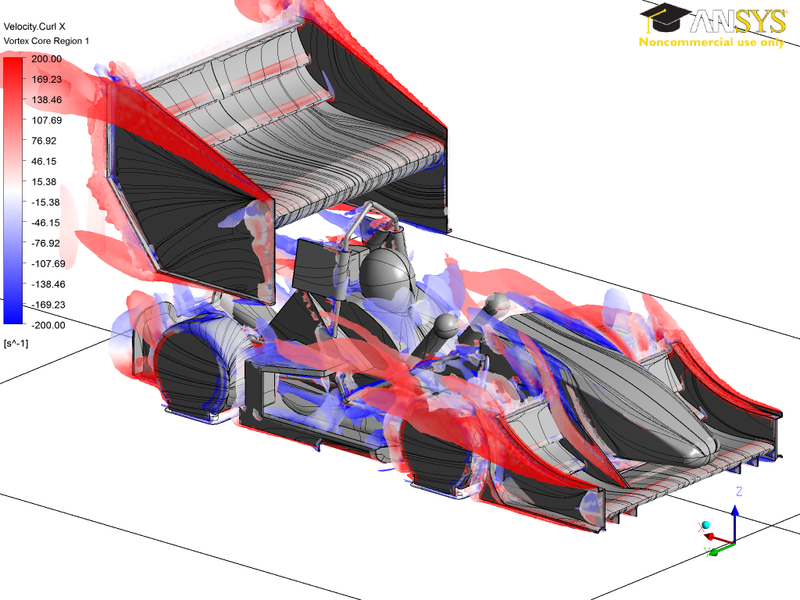 In this guest post, Monash Motorsport members Scott Wordley, Damien McArthur, Marc Russouw, Luke Phersson and Matt Corallo have kindly provided an insight into their use of ANSYS CFD software to optimise the aerodynamics of the Monash Motorsport M13 car. Formula SAE is a worldwide engineering competition in which teams of student engineers are challenged to design, manufacture and test a formula style autocross vehicle. For teams in the Pacific region, each year culminates in the main competition where each car is judged on its design, cost and a business case presented to a panel of judges as well as its performance on track. The winner of the competition is thus the team that has achieved the most points out of the 1000 available over all static and dynamic events across the weekend. From its humble beginnings at the University of Texas at Arlington in 1980, the competition has now grown to include over 600 student teams worldwide with various instances of the competition being held across the globe in countries such as Germany, the United Kingdom, the United States, Brazil, Japan and Australia. Streamwise Vorticity sheets on Monash Formula SAE Racecar. The rule set for this competition is significantly more open than those in the top tiers of modern motorsport and therefore affords the students greater freedom in the search for the vehicle concept that will have the best chance of achieving the team’s goals given their resources and personnel. The Monash University Formula SAE team’s 2013 challenger, the M13, is powered by a 450cc turbocharged single cylinder KTM engine, implements direct acting suspension connected to a tubular spaceframe chassis and also utilises a very aggressive aerodynamics package. This concept was chosen in order to maximise the number of points scored in the dynamic events at competition and hence the team’s chances of winning. The team relied heavily during the early stages of 2013 on almost a decade of experience using LEAP products to design the M13 within tough temporal constraints. 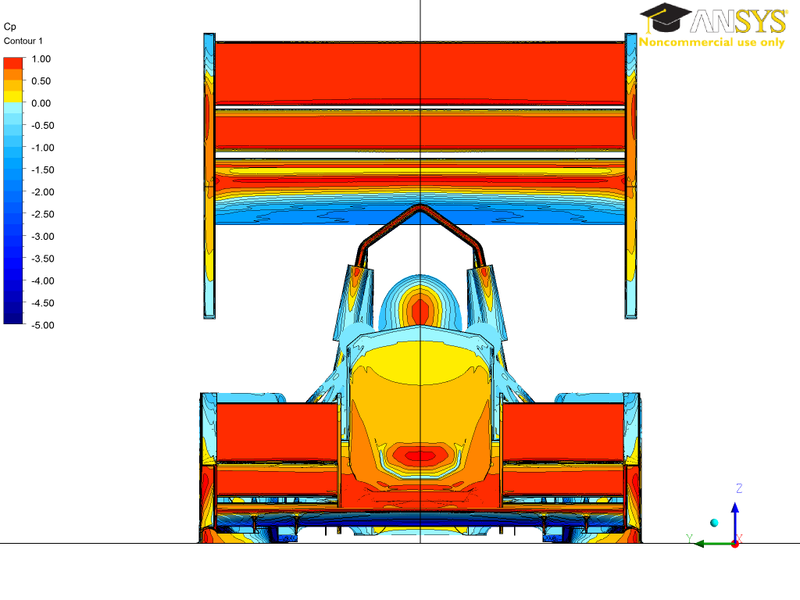 In particular, the team has used the CFX Fluid Flow solver in the ANSYS suite to design the aerodynamics package consisting of both Front and Rear Wings and an Undertray. The objective of the aerodynamics section was to maximise the amount of downforce generated by the car to increase its cornering performance (an aspect of vehicle handling to which Formula SAE tracks are heavily biased towards) whilst minimising any increase in drag. Plot of Pressure Coefficient on Monash Formula SAE Racecar. In addition to these time constraints, the team is only permitted a few days of Full-Scale Wind Tunnel Testing in the Monash Wind Tunnel each year. This necessitates that only the most promising ideas and changes can be tested. Simulations using the CFX solver in ANSYS Workbench allowed the team to automate the entire simulation process so that the turnaround time from making a change to the full-car CFD model in CAD, generating a mesh in the order of 20 million elements and then generating a results report, remained within 16-18 hours. This allowed close to 200 design iterations to be simulated and documented during the 3 month design phase which is a three-fold increase over that of the previous year. For post-processing of results, a standard state file (.cst) template was created so that all simulations could be directly compared without the need for time-consuming work to set up each set of results in exactly the same way. Reports could then be generated from CFD-Post and saved to a collaborative team knowledge base and subsequently critiqued by the designer for future reference. Additionally, the team also used CFX to simulate a Drag Reduction System which was later validated through on-track testing and Wind Tunnel testing to reduce drag by over 50% on the straights at competition. 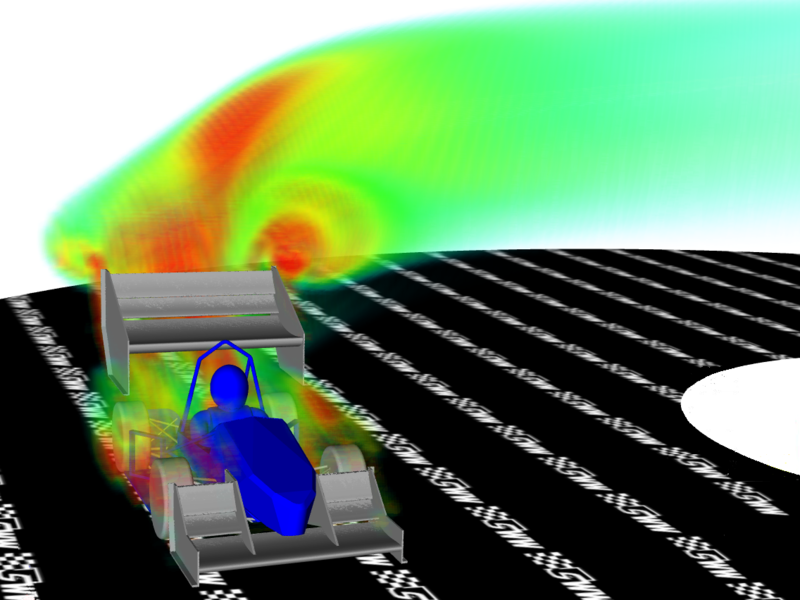 This CFD development allowed the aerodynamics section to achieve a 25% increase in downforce for only a 10% increase in drag. The team’s competition points simulator showed a 50 point increase for both the DRS and increased performance from the aerodynamics package as a whole over that of its predecessor, M12.